This book is compilation of sister Nivedita’s ideas on Indian woman’s education in her own words. She stresses the need for intellectual training and scientific education and character-building education. She points out the dangers in imitating western ideas and the need for harmony of ideals between school and home. She wants Indian woman to travel as much as to study for playing a larger role in national life. She advocates education through Indian vernaculars and developing crafts and allied occupations. She give an awakening call for empowering women for a prosperous future. Only a woman can understand the problems and requirements of women. And greater the challenge, greater must be the woman in head and heart to handle the task. A 'lioness' is required. Swami Vivekananda found such a 'lioness' in Margaret Elizabeth Noble who later becomes Sister Nivedita. Nivedita's keen intellect and sympathetic heart, under the guidance and inspiration of Swami Vivekananda, began to resonate with the feelings and aspirations of Indian women and fashion an education that was most suited for their development and fulfilment. Nivedita's school for the girls of Kolkata was a pioneering endeavour in imparting ideal education and advancement of Indian women. And the whole Indian nation must gratefully acknowledge her dedicated services, amidst various difficulties and prejudices, towards impressing upon the minds of the Indians of those days about the necessity of educating not only unmarried girls, but also widows and married women laden with family responsibilities. Her school was a blessing to the girls and their mothers and an eye-opener for the prejudiced. 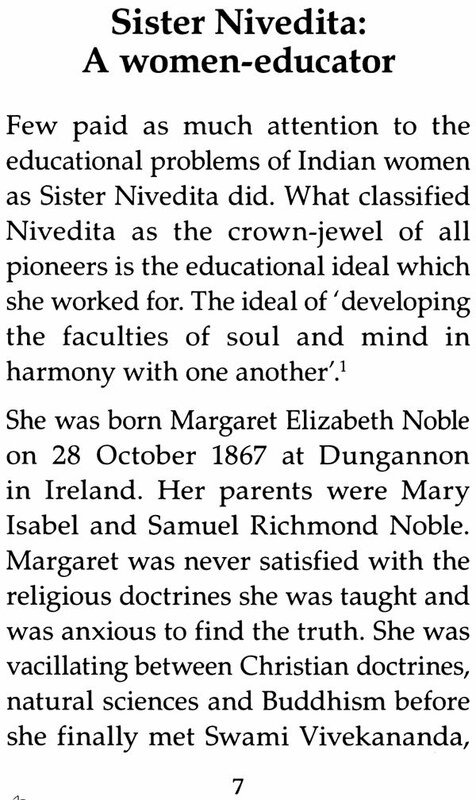 Sister Nivedita has dealt with the ideals and aspects of education with her insightful flair in her speeches and writings. 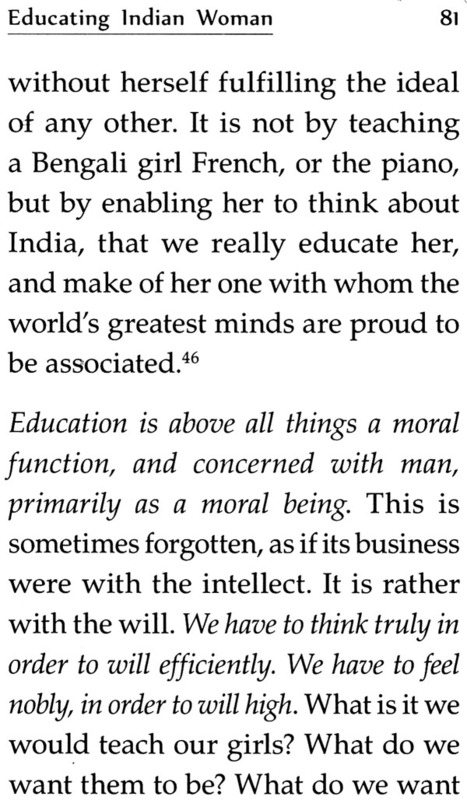 More so is her force and clarity on the objectives and purpose of Indian women education. Anyone who reads her works would find her more Indian than the Indians themselves. 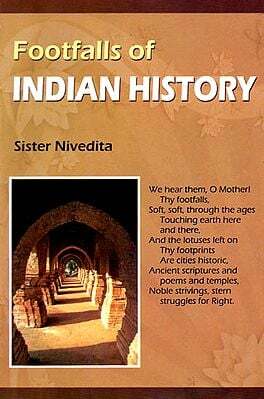 This book, published as part of Sister Nivedita's 150th Birth Anniversary Celebrations, is the compilation and restructuring of some of her ideas on the ideals of Indian womanhood and the methods of educating the Indian women. The title and the subtitles have been given by us. 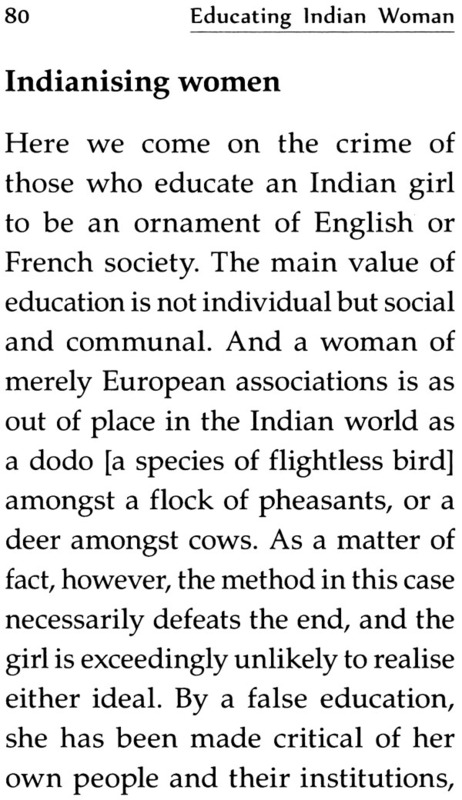 Although some of the ideas in this compilation would seem more relevant to the late nineteenth century or early twentieth century, the basic concept and purpose of educating Indian women remains as relevant today as they were in her times. Even now, a similar situation persists in remote villages as they were a century ago. 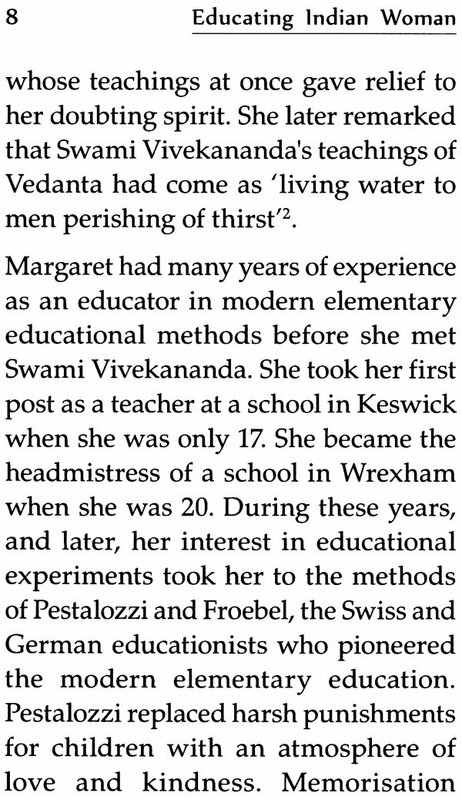 For the benefit of readers who are unfamiliar a prelude Sister Nivedita: a woman-educator sketching her role as a woman-educator. We thank Prof. Sumita Roy and Ms. Deepika for scrutinising the compilation and providing valuable suggestions. We earnestly hope that Nivedita’s soul-stirring ideas and utterances would reach every Indian woman in this modern age, and bring out a befitting transformation in the society.